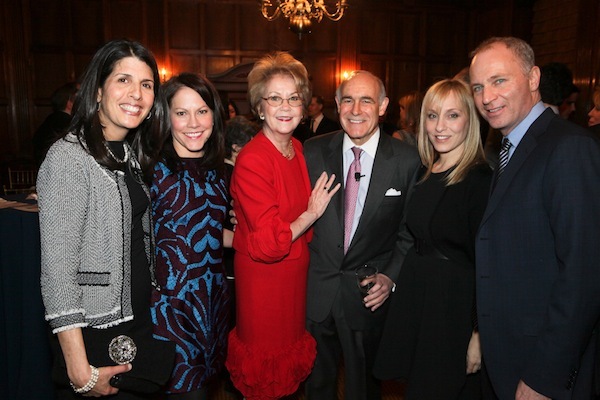 The Gala was held at Gotham Hall and hosted by GDF Board Member Kelly Edwards (second from left above). Also pictured (l to r) David Broser and GDF Board Members Lorie Broser and Marion Yanovsky. 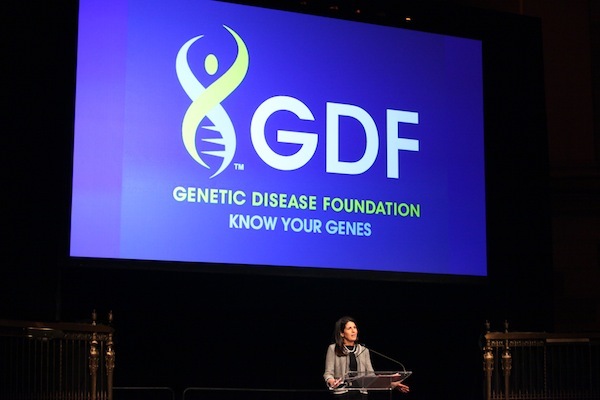 Elisa Ross, GDF President, welcomed guests, recounting her personal story and re-affirming GDF’s commitment to support research and education to help prevent and treat genetic diseases. The GDF honored Robert J. Desnick, PhD, MD, Dean for Genetic and Genomic Medicine at Mount Sinai, whose award was presented by Dennis S. Charney, MD, Dean of Icahn School of Medicine at Mount Sinai. Rogerio Vivaldi, MD, MBA, Head of Rare Diseases at Genzyme Corporation, was recognized as Industry Person of the Year and received his award from GDF Board member Andrea Trombino, the recipient of the Stanley Michelman Hope Through Knowledge Award for her commitment to the GDF mission. During a live auction “paddle-raiser” $10,000 was raised to establish a food pantry for metabolic patients at Mount Sinai, who are often challenged to afford the expensive, specialized foods needed to manage their disease. Additional funds were raised when attendees generously bid on exciting auction prizes including “New York at its Best” (description above). The auction was run by Lydia Wycliffe Fenet of Christie’s Auction House. The GDF is extremely grateful to Jean C. Crystal (pictured above in red) and James W. Crystal for co-chairing the event. Also pictured (l to r):Elisa Ross, Christie Hubbard of Mount Sinai’s Development Office, Dr. Desnick, Lorie & David Broser. We extend our thanks once again to all our guests who gave generously and to our industry supporters including Genzyme Corporation, Shire HGT, Pfizer Inc., BioMarin, Alnylam and Synageva.